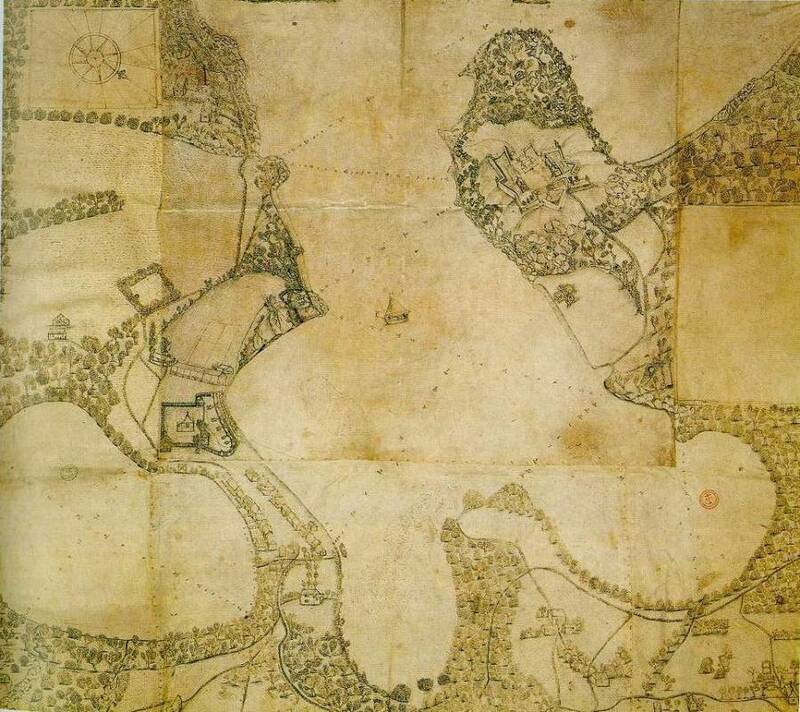 Drawing of the initial French settlement on the sandbar at the entrance to the Lagoon and plan of Fort Royal, c. 1667. On this day, 18 March 1649, French colonists from Martinique landed in the Lagoon, St George’s and initiated a successful European settlement in Grenada, which subsequently led to the destruction of the indigenous population. In 1649 Governor Du Parquet of Martinique, after sending an emissary to Grenada to build a house at a suitable site where arms and munitions could be stored until a proper fort built, advertised for volunteers to colonise Grenada, offering tax exemptions and land grants. It was the last attempt, following a number of unsuccessful plans and attempts by the French. Between 1638 and 1649 a number of prominent French adventurers cast covetous glances at Grenada, which due to its proximity to South America held promising economic possibilities, especially for trade and/or plunder. The first of these was Phillip de Poincy, French governor of St Christopher. Around 1639/40 he decided to take possession of the island with the establishment of a settlement, but abandoned his plans because of the hostility of the Island Caribs in the Windward Islands and the great distance between Grenada and St Christopher. In 1643, Jean Aubert, governor of Guadeloupe, had an agent sent to the island, but a planned settlement never materialised. In 1645 the French Compagnie des Isles de l’Amérique granted a commission as governor of Grenada for five years to Philibert de Noailly, but despite his efforts he never succeeded in landing a settlement. On 14 March 1649, “Two vessels and two barks with enough rations for several months,” building materials, arms and munitions, departed Fort St Pierre, Martinique with 45 colonists for Grenada. On 17 March the invading party dropped anchor off Grenada, and the next day arrived at the St George’s Harbor where they established their settlement. On 25 March du Parquet officially took possession of Grenada in a ceremony following the construction of Fort l’Annunciation, a palisade fort. The unusual activity brought a part of Island Caribs to question the French about their appropriation of the Island Carib land. The impasse was was soon resolved by the promise of French protection against a supposed British attack and the exchange of gifts, especially whisky and wine. Historians, including Jean-Baptise Dutertre and Raymund Devas, have claimed that Chief Kairoüane sold Grenada to the French for beads, knives, mirrors and two bottles of brandy. The fact that the Amerindians brought animals and fruits to exchange for the French “gifts” proves that they were merely trading with them, and the exchange could not have been construed otherwise by either party! Also, Chief Kairoüane was in no position to “sell” the island, a fact made clear when he was banished from the island by his fellow Amerindians because he was unable to expel the French. The French immediately set about the task of clearing land for the cultivation of food crops like cassava and cash crops like tobacco. By June 1650 du Parquet had made plans to purchase Grenada, Martinique, St. Lucia and the Grenadines from the bankrupt Compagnie des Isles de l’Amerique for a mere 41,000 livres (about £1,660), thus “legalizing his claims” to those islands (hence the incorrect date of the Grenada’s settlement of June 1650). Within seven months of the French landing, the Island Caribs began to stage attacks against them in an attempt to dislodge them from the island, especially after they established a second settlement at Beausejour. Following a decade-long conflict between the two groups that say bloody confrontations, ambushes, guerrilla war by the Amerindians and sabotage, the French successfully reduced the Island Carib population and eliminated their threat. See Island Caribs and French Settlers in Grenada, 1498–1763 by John Angus Martin for a more detailed history of the French settlement in Grenada and Island Carib resistance. Get your copy at the Grenada National Museum, Art and Soul Bookstore and Teachers’ School Supplies, Ltd. in Grenada, and at Amazon.com.